The trees are down, the lights away and the chocolates have (as of this evening) all been eaten! All thats left from Christmas is those few extra pounds and of course.. all of those wonderful presents that we received on the big day. For some lucky ducks that included an Orange Pippin commissioned illustration of their homes, buildings and holiday destinations. I couldn’t show these last year before they went to their new happy homes so there was radio silence from me on the commission front. However I can now reveal them and in this blog post I have covered just a few. There were 14 in total, which when considering that last year I only had 2, it was an amazing achievement. I loved them all and hearing the stories behind each one made them extra special. I often get asked lots of questions about the commission process and so I thought I would share a little of the behind the scenes action with you here, here goes! Next the sketch is sent to the client for them to check that everything is where it should be and that nothing has been missed or left out. Once they give me the big thumbs up then the painting can get started.. definitely my favourite part of the whole process. I paint using watercolours and this lets the colours blend on the page as well as in the palette. The brick work can take a little time but this brings the character and life into the illustration. The buildings that are the most interesting to paint are the older brick and stone buildings where each individual stone has multiple colours and tones in it (the Cornish house at the top of this blog for example was amazing to paint!). After the painting has been completed and I am happy with it, then depending on the size of the finished print I will scan it in so it can be edited digitally. This just allows me to resize it if needs be or remove any accidents like paint drips or splodges.. it’s life, it happens. As a digital file I can also tweak the colours to make sure they are bang on and I will need to add the vibrancy back in as this can get lost in the scanning process. This final image is shared with the client one last time (just to be safe) and then voila! The file is ready to be sent to the printers. I use a printer local to me in Sheffield who are very lovely and just a little walk down the road and up a very steep Sheffield hill. This company use archival papers with Epson ultrachrome HDR pigment inks to produce a stunning giclée print. All of this is just a fancy way of saying that the quality is good, like real good. Leave it next to the window in a frame for years and it wont degrade or disappear, good. 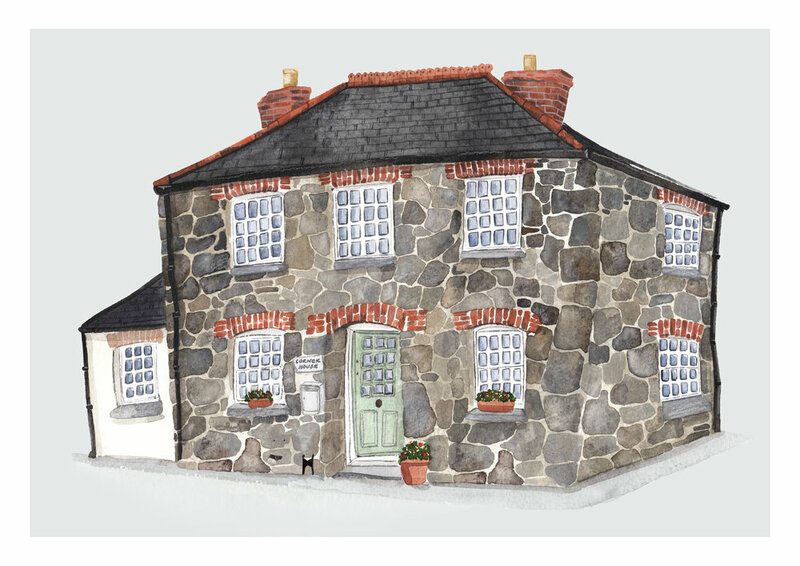 To start each commission, my clients send across photos of their houses, wedding venues, childhood homes or even pubs that they’d like illustrating as well as any extra details. For one family this year it was a rose bush in its full glory after it had been cut down recently; for someone else it was a wheelbarrow in the drive and a cat poking its head around the alleyway. I create a pencil sketch at first, trying not to get bogged down in being too precise but letting the character of the building come through and emphasising any little quirks or features that make the place unique. This was hard to master at first but when you look at a building in real life, every line is a bit wibbly wobbly and so when it comes to an illustration, the wonkier the better! So there you have it; that is how each commission is created from start to finish. If you’re interested in having your own commission illustrated then head over to the Commissions by Orange Pippin on the Custom Menu bar for more information about prices and sizes. In the meantime, here are a few more of the commissions created this Christmas season, from all over the country and for all sorts of different reasons.